I've had this watch for nearly 2 years now. It was an 18th birthday present from my family and was my first Accutron. For the last year and a half however, it wasn't running. I got a quote of $400 dollars to fix it from one jeweler and they wouldn't tell me what was wrong with it. Another jeweler informed me that it was the index wheel but they couldn't find one. So I found myself a NOS index wheel on eBay and took it to the jeweler I use now and it is finally back in running order $200 later. This watch is one I most definitely only use for special occasions. It is in beautiful shape apart from the back of the case where there are some scratches. The case and movement are both dated 1965 (M5). I don't know exactly what the specs are on the gold plating as I can't seem to find anything on the watch itself. I'm unsure if there's any specific variant, but I did see a very similar looking 1965 Accutron on the database, but that one is 18k solid gold and has slightly different markers. The dial has the tuning fork logo as the 12 O'Clock marker and is also marked "Bulova Accutron". The watch came with an unbranded band when I received it and was too small for me, so I replaced it with a long Hadley-Roma calfskin alligator grain band. Any information on my watch is much appreciated! What a wonderful gift for your 18th birthday. Something you can pass down one day. I looked and did not find a match. 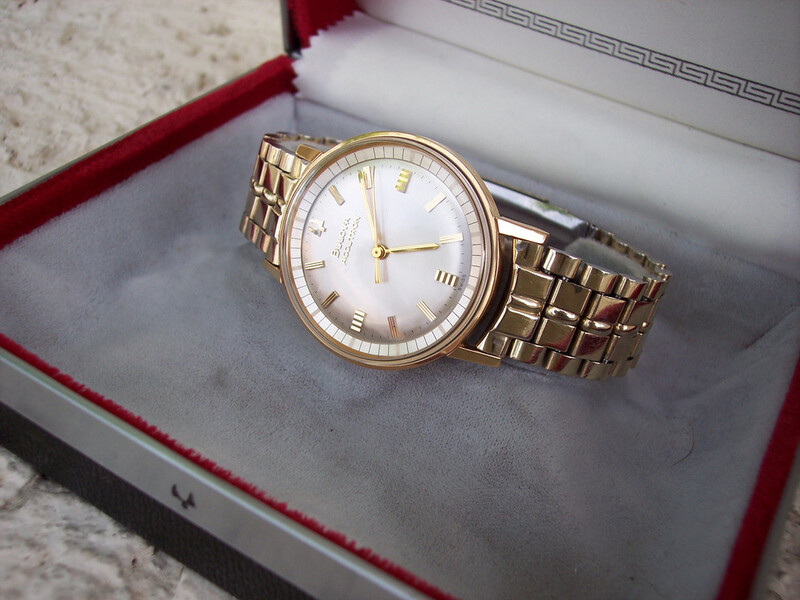 Some Accutron models were stainless with a 14K ring bezel. That might be what you have but I didn't find one with your dial. It's a Swiss-made Accutron 214H with a gold filled case.